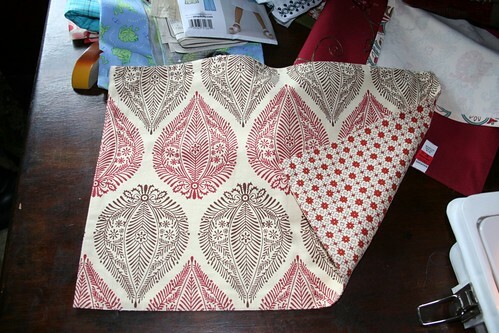 I found this fabulous and crazy simple idea to make throw pillows out of double layered placemats at this fabulous site. How I didnt think of this before now, I have no idea....but I give full credit for this to the artsy-crafty babe. Match my couch and have a different print on back which I thought would be cute. So here is how you do this...so totally easy. 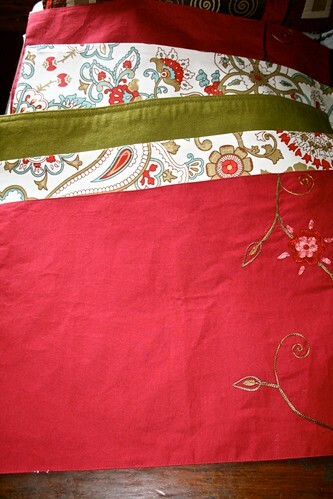 First, take a seam ripper and tear out the stitches on one end. You dont have to go all the way across if you are using batting as a fill, but you probably do if you use a pillow form. Next, you cram it full of batting. You can kinda see the pillow in the background that came with our couches and that I detest. We have 4 of them and I have them stuck in a trunk because I hate them--they are all 80's geometric print. Barf. I decided this would be a great use of the batting in them so i ripped them open with the same seam ripper and am stealing the stuffing out of them. 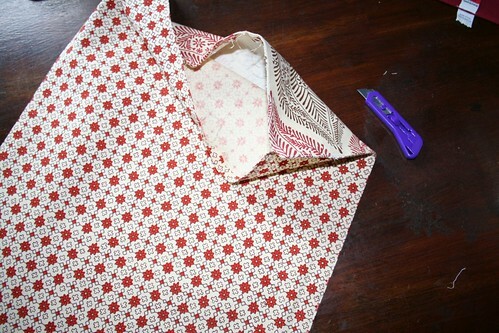 Anyway, the final step is to sew up the seam you ripped out. I suppose you could do this by hand, but I used the machine. You could also embellish these at this point if you wanted. I didnt. That is the hated pillow shell hanging over the top which I will probably just pitch unless i can think of some better use. These arent huge, but perfect for a little back support while sitting on the couch. That is all we use them for anyway. If I want a sleeping pillow, I will go to bed. Here are others that I got to do the same thing with. We have two matching beige couches in the other room that are very plain--since I refuse to put the hideous 80s pillows on them. 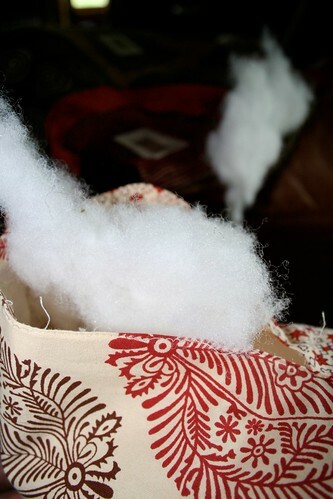 I am going to make these to go on those couches and then I have my eye on a really cute elephant pillow at World Market, but so far I am too cheap to buy it. Maybe next trip. My sister has this same project in the works...you can see hers here. 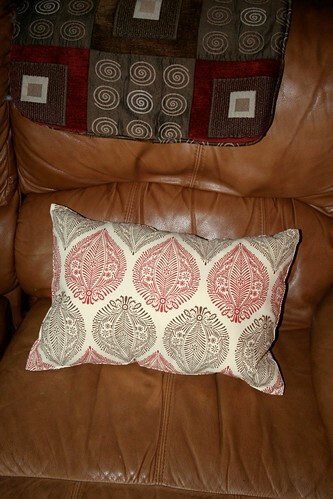 We could very possibly have matching pillows in our house. I got at least three of the same ones the other day, including the one you made a pillow out of. Looks good though. I went and got some solid, shiny gold ones of different shades for my M-day project. I looked at your pics and didn't see the same ones so oops. Oh well, who cares. Our living rooms are hours away from each other. I won't tell if you don't.